What Is the True Cost of Living in Texas? Ever been to the Lone Star State? The second-largest state in the Union by area, Texas has a varied landscape, both in terms of terrain and cost of living. To get a sense of the overall cost of living in Texas, we took a look at state-wide metrics and individual cities. While Texas has plenty of boomtowns, there are also places where prices and wages are low. Here’s what you should know about the cost of living in Texas. What’s your mental image of the quintessential Texas home? Is it a farmhouse in the country? A big Dallas mansion? Whatever you think of when you think Texas houses, you should also be thinking of low prices. According to U.S. Census Bureau data for 2009-2013, the median value of owner-occupied homes in Texas was $128,900. In the same period, the median value of owner-occupied homes in the U.S. as a whole was $176,700. Home prices in Texas are on the rise, however. 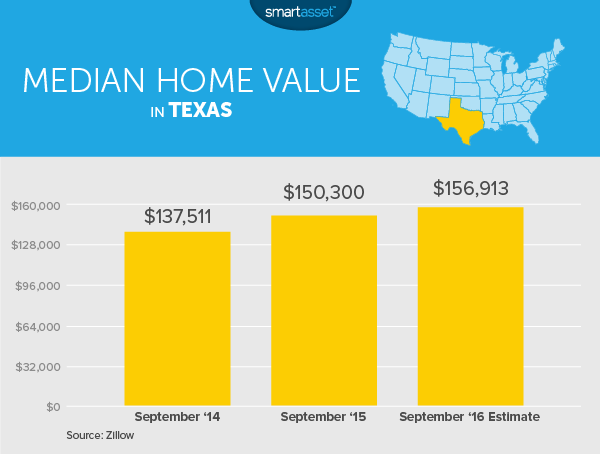 According to Zillow, the median Texas home value in September 2015 was 9.3% higher than it was in 2014. That’s $150,300 vs. $137,511. Zillow projects that by September 2016 Texas home values will have increased by a further 4.4%, for a median home value of $156,913. Here’s some good news for folks who are still on the rental side of the rent vs. buy decision. Texas rents are below the U.S. average. According to myapartmentmap.com, the average rent for a studio in Texas is $1,013. That’s $48 below the U.S. average. A one-bedroom place rents for an average of $898 in Texas, $84 below the U.S. average. Rent for a two-bedroom apartment in Texas averages $1,164, which is just $39 under the national average rent for a two-bedroom places. Three-bedroom apartments in Texas rent for an average of $1,492. That’s only $26 less than the nationwide average. When it comes to utilities, Texas is a mixed bag. That’s because part of the state has a deregulated market for utilities, while other places, including Austin and San Antonio, have utility monopolies. According to the Texas Tribune, customers in deregulated markets pay more for utilities than those in monopoly cities. Still, the deregulated market is getting more affordable and savvy customers can find deals. According to the U.S. Energy Information Administration, the average monthly utility bill in Texas in 2014 was $137.39. That’s about 20% higher than the U.S. average of $114.11. Texas is famous for a lot of food, from Tex-Mex to barbecue, chili to Texas toast. According to the MIT Living Wage Calculator, a single adult living in Texas should expect to spend a minimum of $3,022 on food in a year. A family of two working adults with two children will spend a minimum of $8,903 on food per year. Food prices vary somewhat by city, though. Numbeo.com recommends a minimum monthly spend on food of $296.40 in Austin. The site recommends a monthly minimum of $320.04 in Dallas and $335.07 in Houston. In the boomtown of Midland, it’s $329.03. Here’s the good news: Texas has no state income tax. Sales tax in the Lone Star State ranges from 6.25% to 8.25%, with a gas tax of 20 cents per gallon. Like many states that don’t have an income tax, the property taxes in Texas are on the higher side. The average effective property tax rate is 1.94%. Property tax rates in some counties top 2%. The price of a preventive primary care visit is pretty consistent across Texas cities. According to Castlight Health, the average price in Dallas is $143. In Austin it’s $139, Houston $126 and San Antonio $118. The best deal of the cities studied was El Paso, where a preventive primary care visit has an average price of $111. The minimum wage in Texas is $7.25, the same as the federal minimum wage. But is that a living wage in Texas? According to the MIT Living Wage Calculator, the answer is no. By MIT’s calculations, the living wage in Texas is actually $10.20. 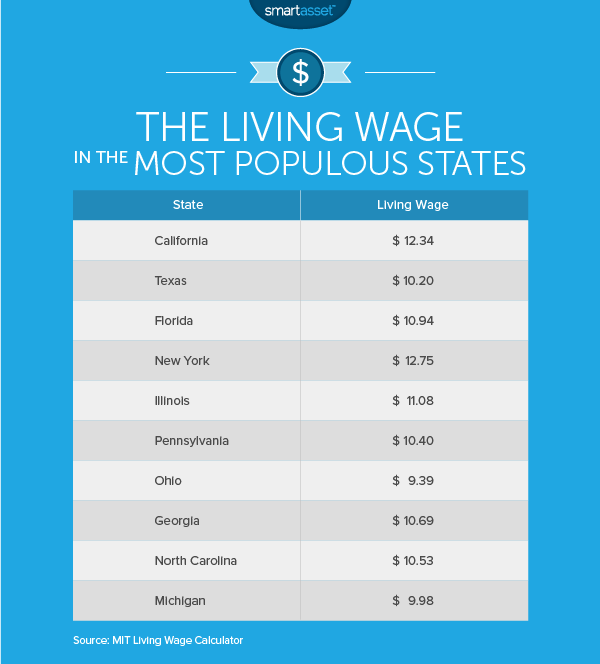 Check out the chart to see how Texas’ living wage compares to the living wage in the rest of America’s 10 most populous states. In New York it’s a whopping $12.75! 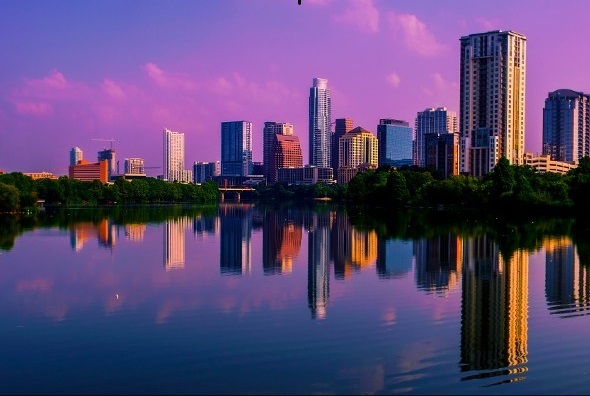 If you are moving to Texas, you may want to pick a new bank that is popular in the area and has good interest rates, account offerings and customer service. These are the best banking options in Texas. It’s also smart to understand how the move will impact your budget. A financial advisor can help you navigate big life changes like a move, or just identifying and meeting your financial goals in general. A matching tool like SmartAsset’s can help you find a person to work with to meet your needs. First you answer a series of questions about your situation and your goals. Then the program narrows down thousands of advisors to three fiduciaries who meet your needs. You can then read their profiles to learn more about them, interview them on the phone or in person and choose who to work with in the future. This allows you to find a good fit while doing much of the hard work for you.